Length: 2.3 miles. Gradient: 310 fpm. Class: V. Character: Intimate wooded canyon with tight, twisty gorges. Guidebook notes: Avoid while Mt. St. Helens is erupting. Hoffstadt is a wonderful little stream, delivering a top-notch creeking experience if you catch it with enough water. The only downside to this run is the access. First, the creek. Hoffstadt is very exciting, winding through an endless series of tiny gorges with more waterfalls and ledges than you can count. 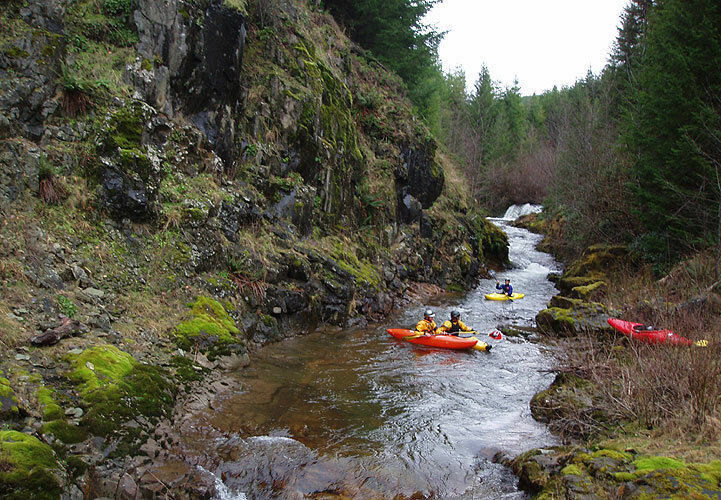 This is definitely some of the best creekboating the Northwest has to offer. The access for Hoffstadt, on the other hand, has changed recently for the worse. Weyerhaeuser (this is the correct spelling..) timber company (who owns the land around Hoffstadt) has closed off both of the spur roads accessing this run. That isn't such a big deal for the put-in, because the hike is relatively easy. The take-out, on the other hand, is terrible. You have two options: A punishing slog up the canyon wall to the bridge, or a longer, less steep hike up the old access road. You have to gain 400-500 feet of elevation either way, so get ready for some serious aerobic conditioning at the end of the day. On this trip, we opted for the hike up to the bridge. One of the most intriguing aspects of any visit to Hoffstadt is nearby Mt. St. Helens, the Pacific Northwest's very own weapon of mass destruction. 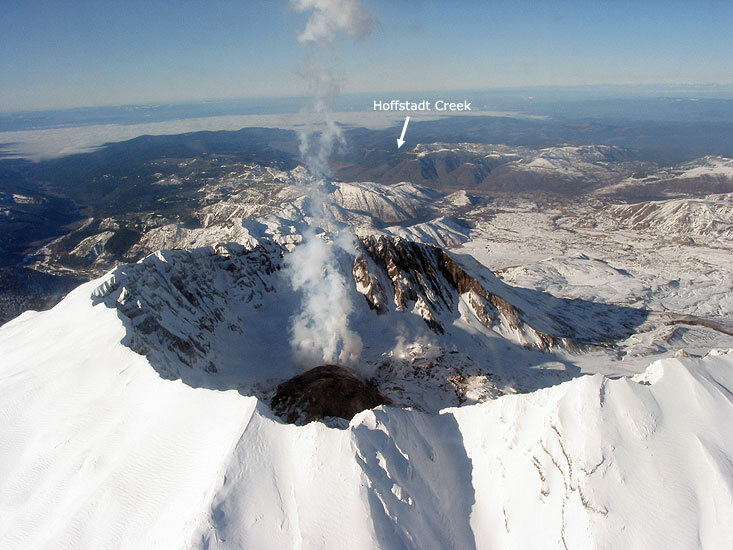 St. Helens is the only active volcano in the continental United States, and we are very proud of our seething little vixen! In 1980 Mt. 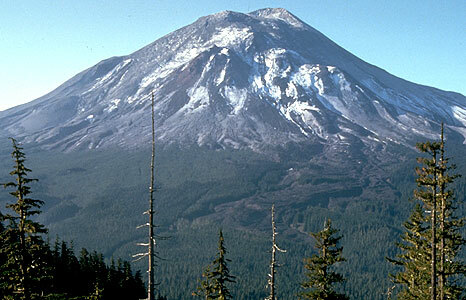 St. Helens experienced a closely spaced series of six explosive eruptions. The top 1,300 feet of the mountain was vaporized, killing 57 people and depositing 200 million cubic yards of mud and debris into the surrounding river channels. Pretty much everything in the immediate vicinity was annihilated and ash was spread across the entire planet. I remember that I was coming back down to Oregon from Canada with my parents when St. Helens blew, and on Interstate Five was it was like a snow blizzard, except instead of snow it was ash. I thought it was pretty cool, but I was just a kid at the time.. It took many years for the local landscape to recover from the devastation in the wake of this eruption. 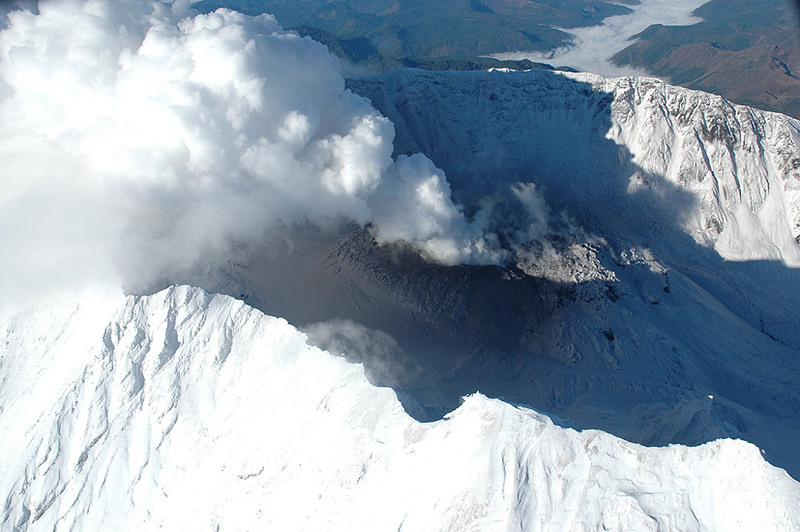 Recently, St. Helens has re-awakened, much to the delight of local volcano enthusiasts! Hmm.. isn't the lava dome on Mt. St Helens growing right now? 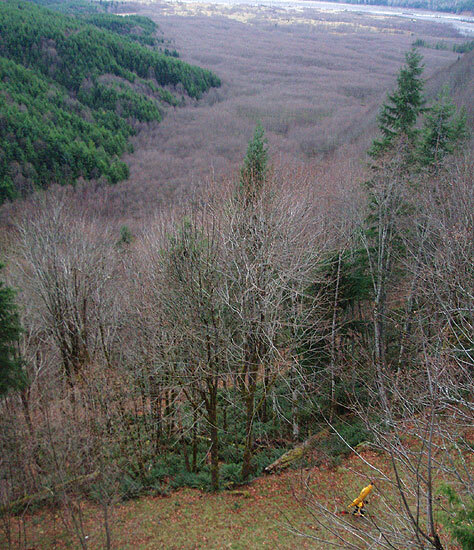 Hoffstadt Creek (viewed in the background) is within the Mt. 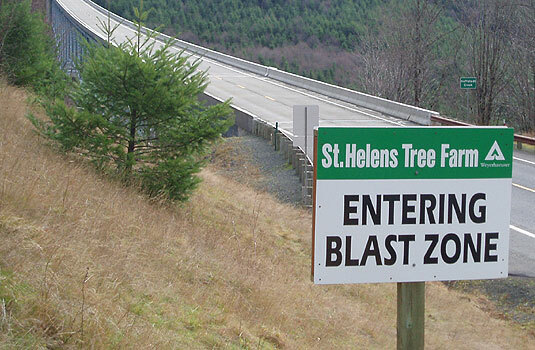 St. Helens 'blast zone'. A photo of the Mt. St. Helens crater, taken from the southeastern side of the mountain by the USGS on January 3rd, 2005. The flattened valley in the right-middle of the photos marks the main mudflow path for Mt. St. Helens, so you might get more than you bargained for if you are on Hoffstadt creek when St. Helens goes nuclear again..
A close-up photo of the Mt. St. Helens crater, taken from the eastern side of the mountain by the USGS on October 20th, 2004. On this particular trip I was joined by Pete Giordano and Jon Fowlkes out of Portland, and Jesse Coombs and James Bagley Jr. out of Corvallis. The guidebook describes Hoffstadt as 'the only steep creek in the Toutle drainage', and our first glimpse of Hoffstadt canyon lived up to the description. We couldn't see any of the crux section, but it looked steep and tight up there. We spent a little time at the bridge peering down into the canyon, absorbing the scale of the take-out hike, which turned out to be even worse than we had imagined..
"We gotta hike up from down there?!?" 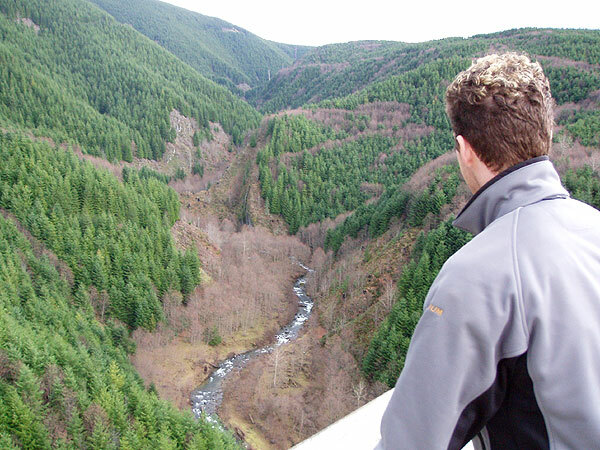 James Bagley Jr. looks up into Hoffstadt Creek drainage while pondering the hideous take-out hike from the creek. The car-shuttle for Hoffstadt has been dramatically shortened now that the spur road down to the put-in has been closed. The hike to the put-in bridge takes about a half hour and is relatively painless, all flat or downhill on a good-quality gravel road. Below the put-in the creek is all bedrock and very narrow, twisting and winding down the narrow canyon. The first drop is a fun ten-foot ledge called 'Bouncer', which is easy and clean on the right hand side. Below Bouncer are more rapids of a similar nature; the creek is all bedrock, no boulders to speak of, at least in the first couple of miles..
A typical view up Hoffstadt. There are lots of ledges and falls on this run, the vast majority of which are ultra-clean. Less than a mile below the put-in is the first log portage. Be careful here, because the creek takes a sharp turn to the right and piles into a gigantic root-wad with some smaller wood thrown in just for fun. The portage is on the left and is fairly easy. 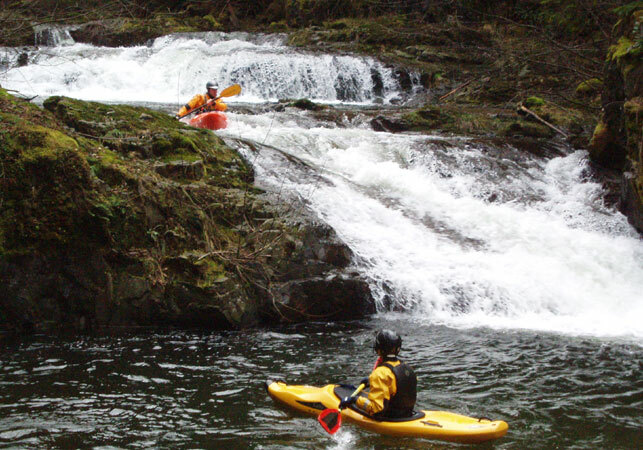 Immediately downstream from this portage is split falls, one of the biggest vertical drops on the run. You can scout this drop during the portage, just leave your boats and hike a short distance downstream to the falls. The falls is very clean, with a good line down the right. Pete Giordano drops the split falls. Downstream of the Split Falls are more fun drops, leading up to Gnargasm, the biggest single rapid on the run. Gnargasm is a jagged series of ledges dropping about 30 feet that has been run ( Jesse Coombs ran it with no problems on this trip ) but it is very nasty and not recommended. If you miss the portage eddy, there are no second chances; you are going to run Gnargasm blind. This is not recommended, but it has been done successfully in the past. A few years ago a local group was running this creek for the first time and the first paddler down missed the eddy and ended up being swept over Gnargasm. He made it to the bottom without major injuries, but the next guy (who scouted the drop before running it) broke some ribs running the drop. Remember, if you get blown into Gnargasm run the left side through the first part, then drive hard right once you get over the first series of drops. The final ledge on the left hand side (the last big horizon line) lands on a bedrock shelf and should be avoided. The higher the water gets, the harder it is to make the eddy above Gnargasm. This is worth remembering if you get to the take-out bridge the creek is big and muddy. Pete Giordano watches as Jesse Coombs runs some typical drops on Hoffstadt. These drops are located immediately downstream of Gnargasm. Downstream of Gnargasm is another big, double drop. This one is pretty chunky and should be scouted carefully. The entire right side pours onto a jagged outcropping, throwing up a huge fan of water, while the pool below the middle of the drop has a piton rock in it, so the left-side line is best. 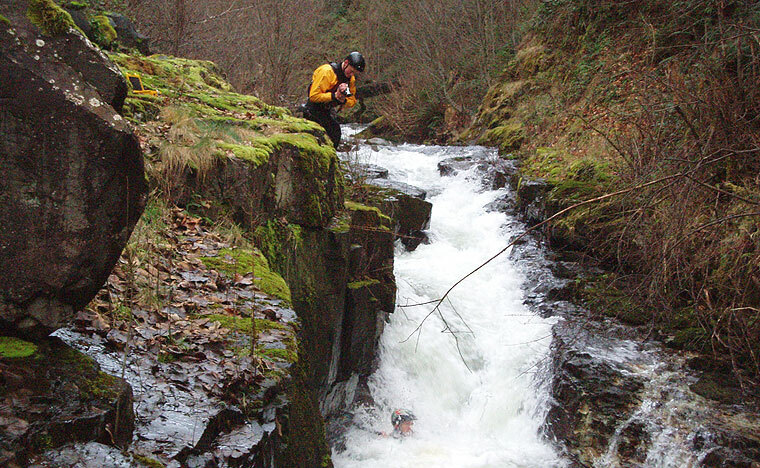 James films as Pete disappears into the bottom hole on the big double falls. More ledges follow downstream, so many that I can't really recall any individual drop. This is truly a vertical-drop wonderland, but there are also a couple of very narrow slot-drops, like the one shown below..
Jon Fowlkes watches as James Bagley Jr. gets swallowed up by one of the narrow slot-drops. Soon the walls start to peel back and the creekbed deteriorates into boulder-strewn drops that are fun but not nearly as good as the slides and ledges upstream. The creek gradually flattens out, and soon the take-out bridge comes into view. As described at the beginning of the report, the take-out is pretty demanding. If you take out at the bridge like we did, look for a trail just downstream from the bridge that has some small, knotted fixed lines that will help you up the first, near-vertical pitch. Once you reach the flat spot at the first bridge piling, stay close to the bridge because the hiking is much easier under there..
Pete Giordano toughs it out on the last pitch of the long, steep hike up from the creek at the end of the day. This is the most physically demanding take-out I have ever done. The main mud flow from the 1980 Mt. St. Helens eruption. 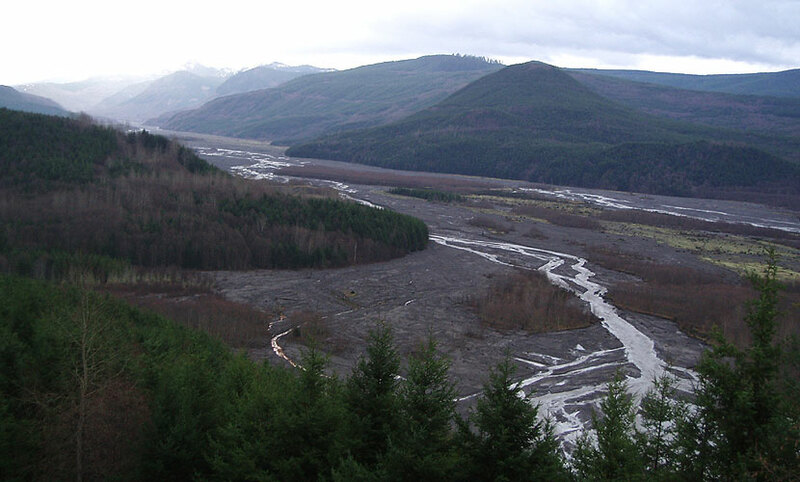 Hoffstadt Creek comes in on the upper-most left hand side of the image, joining the NF Toutle, the river that follows the mudflow. 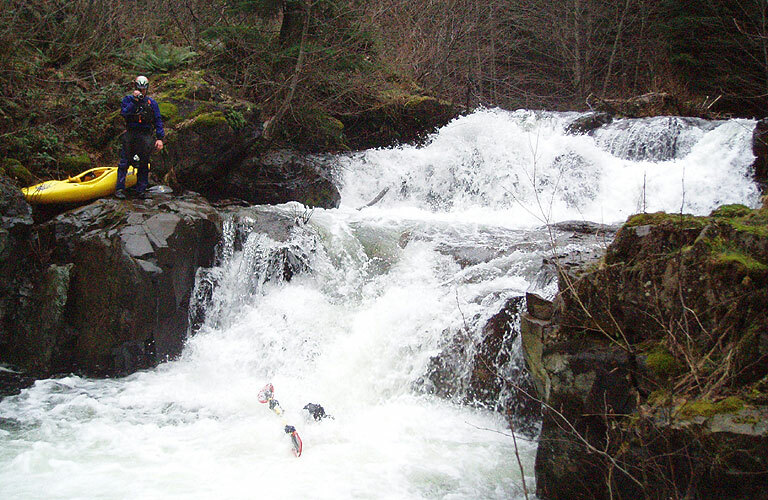 ACCESS: For the complete picture, check out the description in the Bennett Guide to Washington Whitewater. The shuttle directions remain the same, but both roads have gates on them now. Make sure you build in enough time to do the half-hour hike to the put in, and the half-hour hike up from the take-out. 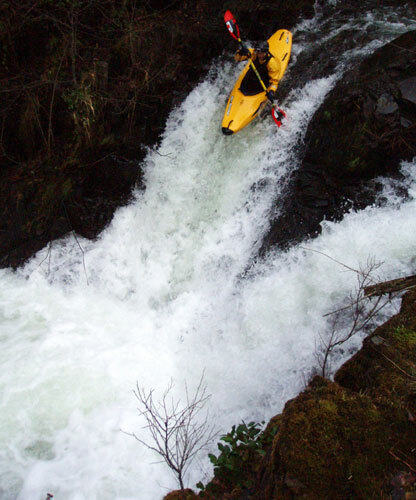 COMMENTS: Don't run this creek unless you are experienced on steep class V runs. Eddies are scarce, so be careful at some flows. The creek itself actually goes pretty quickly, you have to scout a fair amount but it is fairly easy to move around on Hoffstadt because it is all rock and no undergrowth or trees, etc. That said, I think it might be very hard to portage in a few places if you were so inclined and the eddies get scarce at higher flows. There are probably 4-5 log portages right now, so keep a sharp eye out. Be careful above Gnargasm, which is an accident just waiting to happen. FLOWS: I don't know a reliable gauge for this creek. We were in the range as indicated in the guidebook ( about 3,600 on the Toutle at Tower Road gauge ) but we had very low water. I think about two or three times the flow we had would be a good medium flow, but I'm not sure what that corresponds to on any gauge. I think the key thing is that Hoffstadt flashes (much like Oregon's Sardine Creek) so you have to catch it immediately after or during a big rain storm. If anyone has good beta on what is an indicator for flows on this creek, please let me know! More USGS photos St. Helens, before - during - after the original 1980/81 eruptions. Mt. 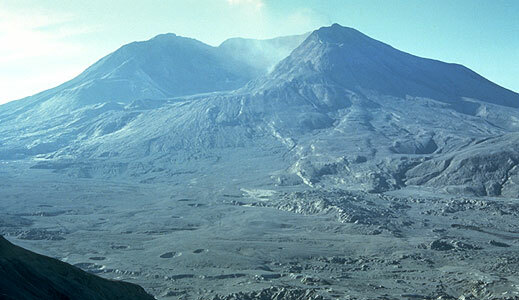 St. Helens, one day before and shortly after the series of eruptions. Both photos were taken from the same place on Johnston's Ridge. Photo credits: Harry Glicken, USGS. Mount St. Helens on 5/17/1980, one day before the eruption. Taken from Johnston's Ridge. Mount St. Helens, taken 9/10/1980. Taken from the same spot on Johnston's ridge. The first eruption of Mt. 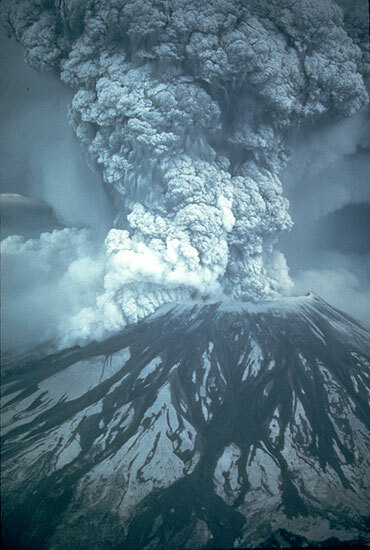 St. Helens, May 18, 1980, at 8:32 a.m.
Photo taken by Austin Post, USGS.